I have a PayPal business accounts and I confirmed with PayPal's customer service that everything is confirmed and set up correctly on my side to to accept non paypal member payment like visa and mc. I have a Jotform with PayPal as payment method. It integrates with my PayPal account but do not allow non paypal account payment. Paypal said it should work and think it is something with the form settings. I believe you need to use our Paypal Pro integration and provide an API username/password to accept non-paypal payments. Is the way you have set the relevant form up? PayPal says no. No need for pro. It should work with a business account. They tested everything and insist the problem is on my side (form generation). They told me they have seen this problem before when forms are used. They asked how the guest option was set. I don't know that since I don't see it. We just have that option in our standard paypal integration. 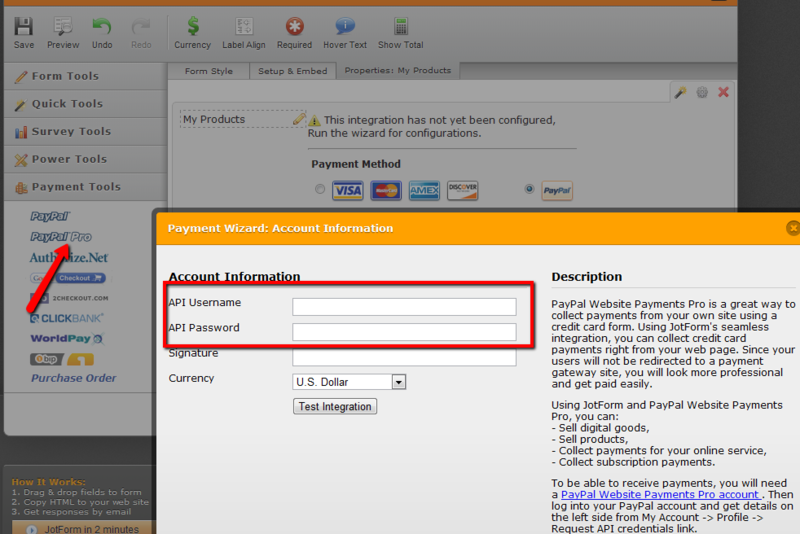 If you want to recieve non-paypal payments via paypal, unfortunately you will have to use our Paypal Pro integration. There really isnt any way around that. That's too bad. Why is that? That will cost me $50 a month! As far as I know, PayPal Website Payments Pro is $30/month + commission. Currently, we are unable to accept payments from non-PayPal members though our default PayPal integration method (Website Payments Standard). However, I have escalated this issue to our Development Team, and this feature may be added in the future. I know other forms are able to do this since the PayPal rep said they had issues with this before and it usually had to do with the "guest" settings. That's all I know. Thank you for additional information. We will keep you updated if anything changes. He actually gave me a phone number to call and said the developer was welcome to call if they had any questions. You want that? Yes, you may leave it here. I just tried to make a $1.00 payment using one of my forms on my site. I use PayPal Standard. I used Credit card only and, though they seem to know I do have a PayPal account (based on what, I don't know), I did not log in. My payment went through fine. Problem is I have not tested this alternate route yet. I think PayPal keeps track of you using cookies and if they think you have a paypal account, they will not show the credit card option. I think that option is also not available on subscription/recurring payments. Thanks. So, subsciptions won't work even with a Pro Account? I think it is possible, but according to PayPal website, recurring payments cost $30 a month in addition to the regular Website Payments Pro monthly fees. However, I have not tested it personally, probably my colleagues can provide more helpful information on this.